I’ve finally got around to organize and show the best of my work while at Anderson Hospital. The 6 months, I must say was – a miracle – and I pulled through with flying colors. I am hoping to catalog and archive these paintings on this post. I am planning to adjust the paintings into printable format for those who are interested in getting just a copy. As for the originals, I am unsure how to price them just yet. I will probably sell them at the farmers market for a couple of weeks (hope to see some interest at my little tent), and most likely auction at some point. I took out two wall paintings I didn’t feel met whatever standard I thought it needed to be.. and most likely because it was a duplicate paint job of lesser quality. So with all good things there is a story that is told. The first three was a symbolic reference to “alpha, omega, crossway, salvage and ambiguity” the ground colors that made this all possible. It was just an idea. The idea of the bridge from the Heavens coming down to Earth is now the focus. These components combined creates a bridge to the Sunset Cave where a Fallen Star from heaven has landed. This is where The Tree of Imagination is now planted. The Nose of the Cosmos knows of specific things which eventually leads it in to become The Weeping Tree in the end. This is where the Dark blossom and Space Rose come in to shine – because in the magnitude of darkness something must exist. In the sea of strange nature comes stranger animals – the Space Whale of all creatures splash in spirit through the sea of stars. The skies filled with already great wonders The Celestial Trees came to soak in the magnificent energy and experience. In the imagination of the Heavens, they create the Space Bouquet in the name of love – and not just any love.. selfless unconditional timeless love. Another bridge; the stairway is to be made instead of heaven to earth – this one to be made earth to heaven. The star that falls here is the Earth Bound Star. Earth touched Trees and mountains and Earth touched Aurora Borealis come into the picture. Out sprouts the Tree of Life and Knowledge reaching left and right, instantaneous as if grown over night. This tree overlooks The Earth and The Heavens and all things good within it. It oversees and introduces pious resolve and virtue of human kindness. This integration of Heaven and Earth present us with the Celestial Bouquet of Earth. With this strange gesture of exchange and to co-exist as a sign of mutual agreement to cooperate under the law of symbiosis – comes the signal of the Blossomed Space Rose. Where the egg of infinity now lay. We have concocted the Phoenix Peacocks it seems. The Phoenix Peacocks establish it’s hierarchy with The Dragon, and The Gryphon, quickly. The Tiger, The Wolf and The Black Lion soon follow. And finally an oddly organized team rises through The Buck, The Serpent and The Great Squirrel. The Animal Totems have come to play but as guardian spirits. By the Equinox of Seasons the trees have a choir in which the twin dual spirits of the great Masculine and Feminine duality playfully flow. The Human Spirits through music of song and manifestation of butterflies ring for all to hear. The Tree of life bursts in a blaze of burning but growing flames of leaves and roots. The Sunset Tree signals that all is ready and well. The Golden Eagle makes way to it’s new home on sanctified foundations it will grow. The grass cut like Golf Greens, it appears like there is an oasis at every turn. The Perspective is good at every angle. The Polar Bear Guardian stands vigilant but at rest. Blissfully at peace. The Green Dragon reveals it’s true self to the audience. 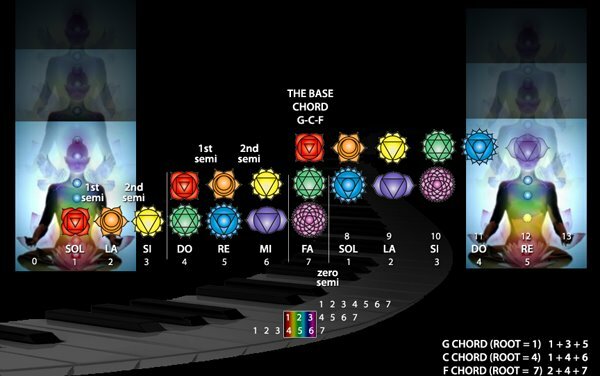 Chakra also has to do with music as shown here. Apparently each note in an octave corresponds to a chakra energy centers. Phi, polar grid, binary, Fibonacci sequence, chakra; music is a mysterious thing in that all these things are related perhaps it has a role in light as well seeing that it could be the wave component and oscillation of another form of light. Experiential Active Light: Experience, Light and Music(Growth and Healing). I found this website that describes the chakra in detail, its relation to the hemispheres of the brain, its relation to music and it’s imbalances, affirmations and much more. Sound Essence of Chakra. I can’t go into how much detail she’s put in her work. Cheers. colors affect mood and chakra generating sources such as your organs. Reiki masters specialize in opening/healing these centers. A Bluish man and third eye? Also on a short note. I had a small dream last night, a glimpse of a bluish weathered rugged bald man with a painted eye over his forehead. I keep thinking about it today like it should mean something, as if we were suppose to communicate, there was a moment where a small sized lightning bolt struck the ground, i read that it means that i am no longer ignorant of something or it could be my awareness or insight to something. I was thinking the man was an old Nacaal, or immortal as they call them. Not sure why i dreamt such weird things or how he got in my head. Your mind and dreams thinking up incomprehensible ideas is pretty normal. The land of Mu, Nacaal and Leylines will be a topic for another time. Phi, pi and Euler imbued in the Giza pyramid, music, Fibonacci, metatron cube, Kabulah, Star of David, Pentagram, the heart, platonic shapes, words, paragraphs and chapters positive thinking.. everything, oscillation, light, male female energy the yin and yang, fractals, dimensions, thinking as a collective. This path has led me up to here and looks like someone has already understood it better/illustrated and explained it a thousands times better then i ever could. It starts off telling about female and male energy. The polar opposite component energies that all humans have inside them. Male energy is suppose to be rigid and squared whereas female energy is curved and circular. The energy is controlled by your right female part of the brain (creativity) and left male brain (focused). The Yin and Yang are a good representation of this balance of forces in a person. Male energy is also very linear and narrow whereas female energy is about being open minded sometimes almost moving in a oscillating state. The Fibonacci law is basically a law that adds it’s previous number with its current to get the next number and so forth starting from 1. It creates a outward spiral effect that is related to the universal constant phi. It is found in nature most of the time. Phi is also called the golden mean being a universal constant going on forever just like Pi and Euler. These three constants are the only none repeating constants that go on forever. They can all be found in one structure in the world called the Giza Pyramid. The Giza pyramid is a interesting complex in that it is built and aligned with the constellation of Orion. There are actually 3 pyramids that reflect the three stars of the constellation of Orion. The Pyramid of Giza has the constant pi, phi and euler imbued in it. It was amazingly said to have been built from the top down which brings me to assume it was created in a way that we do not yet understand yet with our current technologies. The pyramid of giza is said to be the solution to squaring of a circle which was said to be impossible in world of mathematics until they discovered these constants in the giza pyramids and it’s construction. 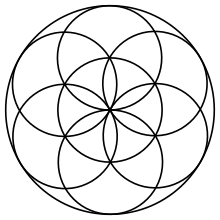 The flower of life is a pattern as seen above that makes 6 circles that create a 6 petal flower. It holds geometric shapes within it such as a cube, the egg of life, Kabulah, Metatron cube, a pentagram, hexagon, the fruit of life and other very important geometric shapes. If you are not familiar with these shapes here are some brief descriptions. It consists of 16 circles. And has a “zone of hullucida” all cells have this “zone of hullucida”. Cube: 4 sided object with equal sides. Egg of life: 8 circles seemly overlapped to make a 3 dimensional cube of circles. It is the morphic essence of what your starting embryotic cells are made of. This 8 circle egg structure is the embryotic cell that creates the color of your eyes, heart, liver and basically all parts of your body. Kabulah: Is an ancient Nemurian/Atlantian/Jewish tree that is represented by a planets on the sides and an evolving state of elements from the bottom as the elements moves to Moon, Earth, Sirius to the crown of god. The left and right pillars are called the pillars of mercy and severeness . Left pillar consists of splendor, strength and understanding. Right pillar victory mercy and wisdom. the lines connecting the circles inbetween shows the path and connections it has to it’s neighboring circles. The sequence is a ascending left to right zig zag pattern or descending depending on which way you want to see it. Metatron cube: This is also found in the flower of life and it is a 3 dimensional geometric star shape with 8 points. In it holds the 6 pointed star, hexagon and fruit of life, egg of life, flower of life and even a Kabulah. The Metatron cube is derived from the egg of life. The fruit of life is a female structure with its curves and when all circles are connected to each other with lines it creates the greatest structure ever the Metatron’s cube. It’s a divine shape based on the Platonic solids of Plato’s “The Elements”. All 5 elemental platonic solids fit into the Metatron cube. 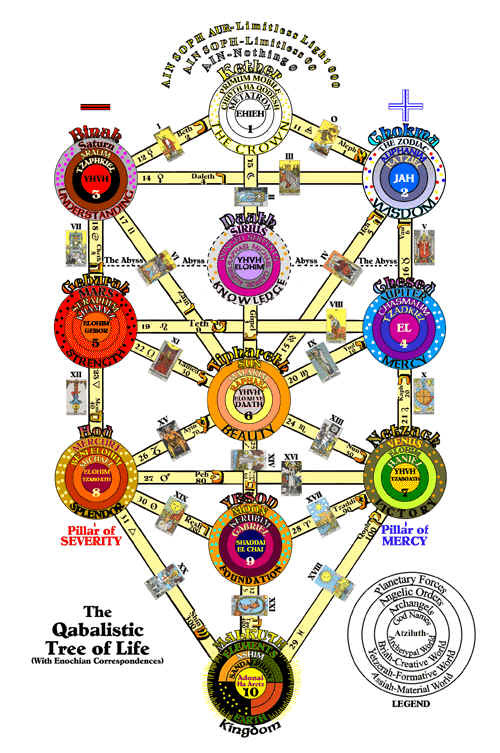 The fruit of life is basically the above picture with the 12 circles only. This is what creates things as they are and the basis of all things that are made in life. If you’ve ever studied the 5 elemental platonic solids they are made of corresponding tetrahedron, hexahedron, octahedron, icosahedron and dodehedron. All faces and edges are equal. corresponding elements are fire, earth, air, water and ether. Ether is a inter-dimensional element which i don’t think we’ve been able to study yet. It is also called Tachyon or Prana Energy. It is an illusive element able accessible anywhere anytime in space. There is also a 6th element called the void. 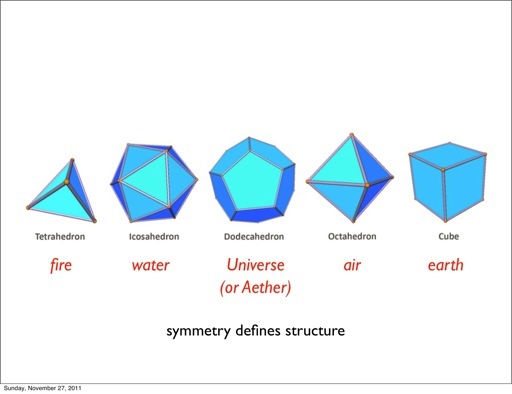 These are all the elements that are said to be in Platos elemental platonic solids. There are all shapes available to us except the hexagon. The hexagon is also a strange in that it only appears in a microcosm to macrocosm order especially in the flower of life. The Egyptians knew a deeper basic level of geometry and it may or may not have been true that it was first seen being used in Lemuria or Atlantis. 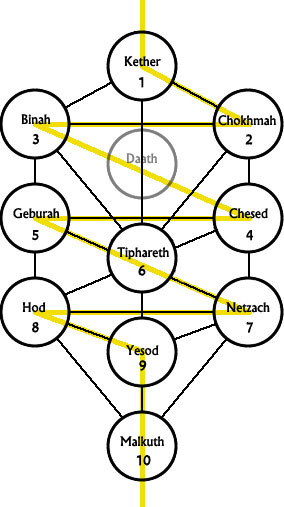 The tree of life (Kabulah) and the flower of life was the most basic of their geometric knowledge. Vesica Pisces is when two circles overlap to make an eye. It is said to be the beginning of consciousness. This is also how the Flower of Life begins. It also has the roots of 2,3 and 5 which are numbers that go on forever. The Seed of life actually looks like the egg of life but it has a circle surrounding it. It has some biblical references to it saying that it came from nothingness, “god moved to” and “there was light” to cut it short. This is the sequence in which the seed of life is made. Music – As a component of experiential life. Music is the color of life. It expresses the moods and emotions in a song. Just like an experiment about how certain clothing will make you think better about yourself thus improving your ability to do things, “Clothing Powers” so does the music that you carry on you. Life of experience cannot be complete without the accompany of the notes and song of a, (for example’s sake) acoustic guitar melody. It doesn’t matter what instrument you use to lighten up your day. Music may help in performance and sometimes growth according to an experiment with plants and music. Plants will grow much faster with Beethoven piano music opposed to no music. Constructive and sound music will provide a constructive sound environment. Music encourages growth, so does Sunlight in it’s providence of vitamin D. These are the components to experience or growth and healing. They both have a great impact on life itself both as a stimulus and a catalyst for healing and growth. Our two main reception functions are through sound and sight, they are the most valued source of experience in life. Just like in life we must compose our own song with each decision and idea we make. With time we’ll compose a song of light and spread it where it is lacking light. We’ll do this until our world is a glowing radiant ball of a symphony on Earth. Glowing and radiating music and heavenly light across the dark abyss of space.